being little • bristol uk fashion & lifestyle blog. : so this is the new year. Happy New Year! I hope you all had great nights last night, with those that matter, and I hope you're not too hungover this morning! I posted my resolutions yesterday, and during my night at home with the telly and a big box of chocolates, I had a lot of time to think. I know I've touched on it previously, but I really think I can get some way towards the life that I want in the next year. I know it's going to be hard work, but I feel like I'm so much more ready for it now. If you ever see me uttering words of negativity, please point me in the direction of these New Year's posts, remind me what I'm working for!! I also want to take a couple of minutes to say thank you to all you lovely people for taking an interest in what I do. It's SO heartwarming to read all your kind words, and I think it's really helped me to believe I can really be/do what I am aiming for. Thank you thank you thank you! No photos again today, as I'm even more poorly! Not a pretty sight. But there are a few new year's posts I have enjoyed so far and I think you should read them :) check out Shawni, Elsie, Katy, Cait, Orchid Grey, Bee, Cherry, Katie, Chelsea, Kim, Nirrimi and Kaylah. Also, a couple of cute ideas from Annette, Kate, Trishie, Notebook Doodles and Kate. Hope you get well soon hun. and happy new year !! All the links do work! Hope you feel better soon, and good luck for the future. That song has taken me back, I love Death Cab For Cutie. You can do anything! I love reading new years resolutions. I had an awesome time. watching fireworks on the balcony:)! I like reading lists and resolutions. thank you for the link :) I spy you in one of my piccies too! ahhh summer, I feel all nostalgic looking back at those photos. Hope you're feeling better soon, I'm all ill too :( ugh! I got a book for christmas which i have just started using, not sure if you have heard of it, its called Mess by Keri Smith, theres examples on my blog of how you fill it, its good stress reliever, reminds me a bit of some of your books! 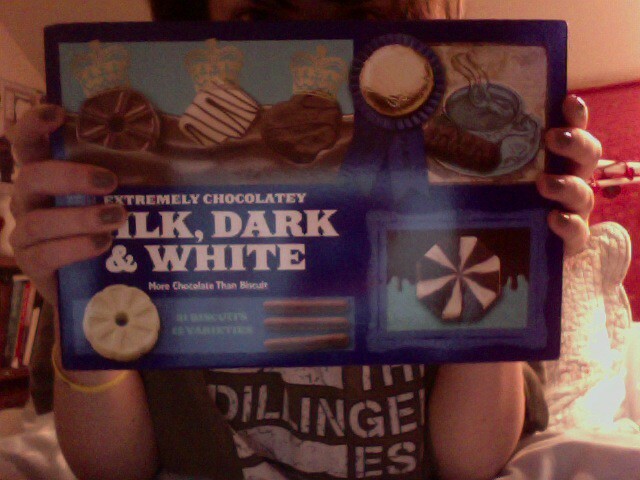 When I read the title of this post I started singing Death Cab so I was rather impressed that I could click the button and listen to it (: Corr, that box of biccies looks orgasmic. Hope you had a goodun sweet and that all your plans get put in place in this next year. You deserve all the nicest things in the world my sweet. happy 2011. I wish you had a marvellous night. You have a great blog.. its not only fashion but mixed with other things i like it very much. But also your style its very nice. I wish to follow you to keep on track but unfortunately i cant find google friend connect? not the way i do love you.